There are estimated to be over 7000 languages spoken in the world today. Our region is rich with diversity. Australia has hundreds of indigenous languages, Papua New Guinea, Australia’s northern neighbour, is home to over 850 languages and Vanuatu, another 105. 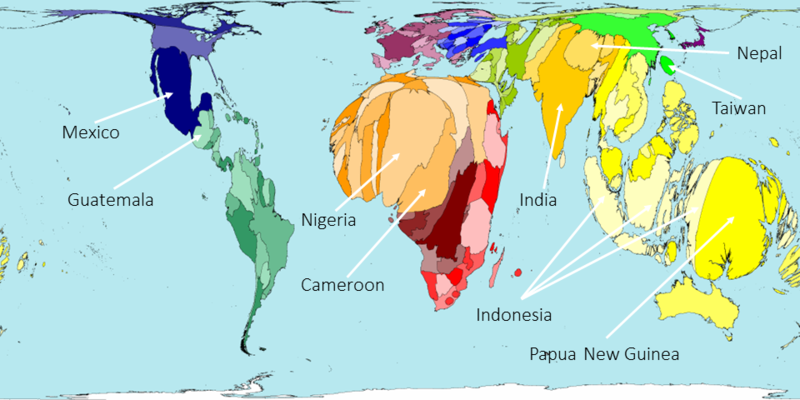 To get an idea of how many languages are spoken around the world, take a look at this map created by Worldmapper. So what are we seeing? This map shows each country inflated (or deflated) to represent how many indigenous languages are spoken there. In Africa we see two giants, Nigeria where over 520 languages are spoken, and Cameroon where about 280 languages are spoken. In our region, as mentioned, there is Papua New Guinea, and Indonesia which is also home to some 720 languages, and Taiwan has about 20 indigenous languages. India and Nepal, too have 460 and around 60 languages each. And over in the Americas, Mexico’s size reflects the 280 languages spoken there, and Guatemala, just below it has another 27 languages. Checkout our section on indigenous languages of Australia. For information about language families and lesser known languages of the world we recommend looking at the Ethnologue or Glottolog. The World Atlas of Language Structures Online gives information on how languages differ and there are maps showing where languages which have particular features are dispersed throughout the world. Questions and answers: The BBC’s language page has some interesting questions and answers to get discussion flowing, as does the Max Planck Institute. Languages can differ in many ways. They may use different sounds, they may make words in different ways, they may put words together to form a sentence in different ways, and that’s just for starters! When we talk about a ‘language’ we mean the act of speaking, writing or signing. We don’t mean the way … Continue reading How can languages differ?